6 x EH505 and 3 x EH503 projectors installed with short and long throw lenses. 3D-tek provides high quality and professional audio-visual projection systems. “A great achievement, and at the same time a very valuable experience for us, is the seamless integration of static images together with an audio-visual accompaniment that highlight each other in an ambient environment. Through the efforts of 3D-tek and our projector supplier, we were able to achieve the artistic and technical goals that we set before ourselves." 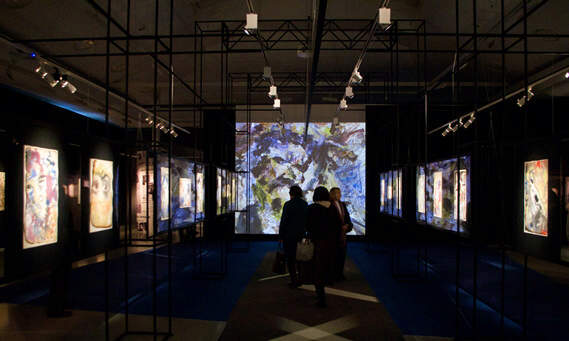 Задача: To create a multimedia installation in the New Manege exhibition halls, located in Moscow’s Red Square district, to introduce the works of Russian artist Anatoly Zverev – nonconformist painter and visionary. The project team wanted to accompany the exhibition with large high quality video images, to immerse visitors into the artist's world. Решение: Optoma's new ProScene EH505 and ProScene EH503 projectors were installed together with 3D-tek's specialised projector screens, designed to increase contrast and reduce visible pixel structure. Результаты: The exhibition, featuring numerous works by Anatoly Zverev, has been brought to life through the spectacular image quality and outstanding brightness of Optoma’s 5,000 and 5,200-lumen WUXGA and 1080p resolution projectors. The New Manege Exhibition Centre, in Moscow’s Red Square district, is one of the most popular venues in Moscow, hosting renowned international events throughout the year. The New Manege Museum and Exhibition Association (MEA) launched a series of new exhibition projects which combine art and cinema. 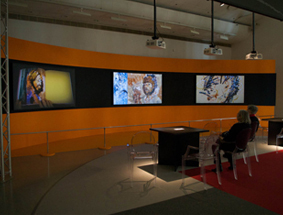 Using audio and video, viewers are immersed in the space for a completely unique experience which, until now, had not been seen in many Russian exhibitions. The project team wanted to create an unforgettable experience for visitors, blending video and sound with Zverev’s original artwork. The setup required several high quality and cost effective DLP projectors with different lens options and projection capabilities. The projectors had to be capable of portrait and landscape modes and flexible enough to install in tight locations with real space-constraints. An additional challenge was that the exhibition is an important step towards the MEA’s plans to open a new museum, dedicated to the life and works of Anatoly Zverev. 3D-tek, having worked with Optoma on previous projects, was aware of the quality and huge range of DLP projectors and lenses it offers. The ProScene EH505 and EH503 were the obvious choice for the exhibition because of their outstanding flexibility both in terms of projection capabilities and installation. The 5,000 and 5,200 lumen projectors with WUXGA and 1080p resolution and interchangeable lenses deliver spectacular image quality and outstanding brightness. 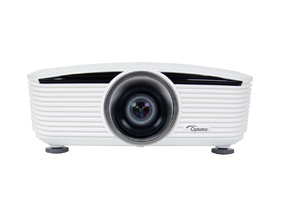 Both projectors feature DLP® (Digital Light Processing) technology, pioneered by Texas Instruments, which produces high quality images and ensures the projectors do not suffer colour degradation over time, as sometimes experienced in other projector technologies. The dust-sealed, filter free design prevents dust and dirt from affecting the system ensuring optimal image quality with minimal maintenance. This provides ultimate reliability in their 24/7 operation. The EH505 and EH503 have multiple lens options, with zoom and focus adjustment to get the exact image size needed, while the wide lens shift range and off axis short throw lens option gets the image exactly where it is wanted. In total, four EH505 projectors with short through lenses were installed, together with two EH505’s and three EH503 projectors with long throw lenses used in portrait and landscape modes. The ProScene projectors were installed together with 3D-tek's specialised projector screens, designed to increase contrast and reduce visible pixel structure. 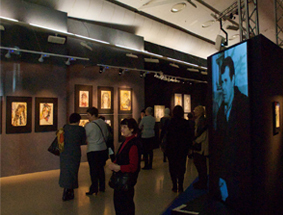 The exhibition, located in the New Manege exhibition halls, opened to the public on 28th January 2014. The multimedia exhibition takes visitors through the variety of genres and forms of the artist’s work including recently acquired and previously unknown paintings, even to industry experts. Using audio and video, viewers are immersed in the space for a completely unique experience which, until now, had not been seen in many Russian exhibitions. 3D-tek chose Optoma’s EH505 and EH503 projectors due to their high resolution (WUXGA and 1080p) and BrilliantColor™ technology which produce stunningly bright images with perfectly balanced, life-like colours. This meant a realistic reproduction of the artist’s work could be projected on a huge scale, without sacrificing image quality. The compact EH505 and EH503 projectors have comparable features to much larger installation models, allowing greater flexibility. The different lens options and lens shift capabilities made installation easy as the projectors could be adjusted perfectly to the space limitations and image requirements. The exhibition, featuring numerous works by Anatoly Zverev, has been brought to life through the spectacular image quality and outstanding brightness of Optoma’s 5,000 and 5,200-lumen WUXGA and 1080p resolution projectors together with 3D-tek's specialised projector screens. The exhibition is also an important step towards opening a new permanent museum to display Anatoly Zverev’s numerous works. The planned AZ Museum, located in Moscow is currently under construction. 6 x Optoma EH505 projectors – 4 with short throw lenses and 2 with long throw lenses. 3 x Optoma EH503 projectors with long throw lenses.